Standing in the garden, feeling the gentle breeze upon my face, hearing the rustling of leaves touched by the breeze, hearing the gleeful voices of children at play in the school yard just beyond, the song of birds in the air, I was immersed in solitary witness, joined with all of Boston in a minute of silence one week to the moment when two bombs shattered our city and our hearts. That stillness of witness speaks so loudly of our being one, across all lines that would divide. In pausing we are touched by a spirit of gentleness, the heart open to hear its own beating, to hear the still small voice of God. In that moment of collective stillness when we pause to remember and affirm, our shared vulnerability becomes our strength and seeds of hope and possibility are planted. The challenge is to hold on to that sense of oneness and unity that is spun from the silence. As so many reach out to each other, shrill voices rise to shatter the stillness, even as the bombs themselves have done, adding to the pain and heartache, breaking grieving hearts into yet smaller pieces. So did my heart break further in reading the op-ed in the Jewish Advocate that condemned our Muslim neighbors, poison words meant to sow fear; that would divide us from each other. 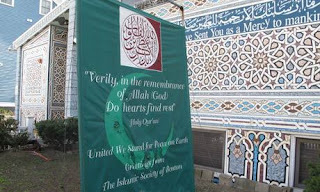 The Muslim community has probably been the most organized of all of Boston’s faith communities in its response to the tragedy, organizing blood drives, providing space, collecting money, coordinating volunteers to help in whatever way called upon, providing counseling services for their own community and beyond. 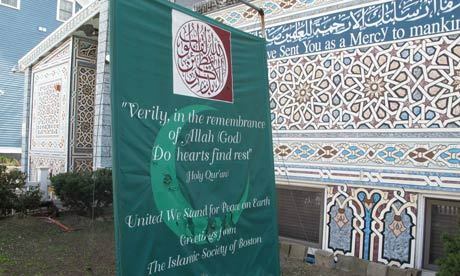 And yet they have had to defend themselves and their religion, to justify their own grieving among the citizens of Boston. In the Torah portion of that week, Parashat Emor, we are told, and do not profane My holy name/v’lo t’chal’lu et shem kodshi, for I will be sanctified among the children of Israel/v’nikdashti b’toch b’nei Yisrael, I, God, make you holy (Leviticus 22:32). This becomes the basis for Kiddush Hashem/the Sanctifying of God’s Name. In its most extreme expression, Kiddush Hashem refers to martyrdom, when all that is left is to affirm with one’s life. More importantly, to affirm with one’s life applies in every moment of our lives. A way of life, Kiddush Hashem is a commandment to each one of us to live in a way that sanctifies God’s name through deeds of righteousness and goodness, affirming the best of who we are meant to be. I received a gift during the week following the bombing, one that came as an opportunity to sanctify God’s name in the face of so much that would deny it. A friend and colleague in “Building Bridges through Learning,” a program to bring imams and rabbis together, called me late one night. 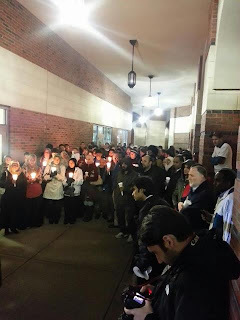 The associate imam of the Cambridge mosque so much in the news, as the mosque attended on occasion by the bombers, he asked me if I would offer a prayer during their first Friday service since the bombing. Toward cleansing and healing, standing with and for each other, it was a great and humbling honor to be among this congregation. I was moved to tears by the sobbing of an elderly man as I spoke. He was sitting on the prayer rug just to my left, saying over and over through his tears, Amin, Amin. As we reach out to our neighbors, may the Holy One say Amin/Amen. God of Avraham/Ibrahim, Hajar and Sarah, Yitzchak and Ismail, guide us please in their footsteps along paths that are so beautifully different and the same. Open our hearts to know that until we embrace each other we cannot fully embrace You or be held in the fullness of Your embrace. Holy One of Being in Whose image each of Your children is created, receive our tears that flow from so many eyes into one great wellspring of humanity, waters of life freely cried, rivers that join us all in so much pain and sorrow. As You comfort us, we shall comfort You, receiving Your tears in the vessel of our prayers, holding them in the tenderness of our hearts, honoring Your tears, dear God, with deeds of loving kindness one to another. Of so many bowed in body and spirit, Healer of Shattered Hearts, bind up our wounds and make us whole, raise us up to reach for the sky, each of us an angel in Your service when extending a hand to another. Let us be at all times in the spirit of those who rushed to the fallen on that day. Give succor to the wounded and the grieving, healing those of broken limbs and torn bodies that they might dance and sing and smile again. Hold close to You the souls of those whose lives were cruelly taken, torn in all their beauty like springtime flowers from the garden of Earth. May we honor You in the noble and worthy ways of our honoring them. Let not our fear give rise to hatred, of finger pointing and blame. That is not the way You seek of us, not the way to ease Your pain, nor to look beyond our own. Open our lips to speak Your name with holy words of love and hope, that we not succumb to tough talk that in its speaking divides people into us and them. We are all one, and of one faith, whatever its name and path to You, in our city, in our state, in our country; hands reaching around the whole world in one great yearning, a prayer for violence to end, a promise to work for peace. May the echo be heard and magnified, the spirit of their words rising, of a gathering of imams and rabbis that was held in this holy space, coming to learn each other's sacred texts, building bridges from heart to heart and house to house. Let that be the message that goes out from this mosque, from this house of Your dwelling among us, God of Ibrahim/Avraham, of Sarah and Hajar, of Ismail and Yitzchak. May we, Your children and theirs, go forth together, walking hand in hand in the springtime sun toward healing and wholeness.